Hackney Brewery is a small micro based in Hackney, London. It was established in 2011 by Jon Swain, and myself, Peter Hills. Jon’s in his late-20s and I’m in my mid-30s. We met nearly 10 years ago while working at The Eagle pub on Farringdon Road (the first gastropub according to folklore) and have worked on and off together since then. Our first commercial beers went out mid-2012. Early memories of mine include helping my grandad homebrew, then later drinking his beer! Jon and I have been homebrewing together for a few years. It’s good to homebrew. More people should homebrew. While we were working at the Charles Lamb pub in Islington we had the opportunity to try a wide range of really good beers, cask, keg and bottle. Visits to local breweries kind of got our minds ticking and the timing seemed right to get into the industry. I’m a biologist by education and previously a chef by trade. I like the science side of things as well as the hands-on day-to-day work. Running the brewery always keeps me thinking. We’re based in Hackney, London. We have a 5.5bbl plant in a railway arch under the new East London Line. We brew between 3 and 6 times a week. We need more casks. I think the fundamentals of brewing are the same whoever you are. Different brewers are driven by different objectives. Very roughly, ours is to produce well-balanced, interesting beers that you’d go back for again. Nothing too far in any one direction, but well-hopped, interesting malt-bases and drinkable styles. Also Jon dropped a pencil in the copper on a test brew once – I don’t think many other brewers do that. We tend to make beer styles that we enjoy. We’ve been limited by fermenter space until recently – just got a couple of new ones so look out for a bit more variety in the future. Loads of research, a bit of disagreement, eventual agreement, taste, adjust. Usually takes a couple of goes to get it right. Now we know our kit better it’s getting easier to dial it in from the start. I’d like to think it’s all down to the quality of the beer but the reality is that there’s a new-wave of beer drinkers. It feels like a natural progression from the interest people have shown in good-quality, locally-sourced food over the last ten years. We got really lucky when we started-up. A top branding agency, Egelnick and Webb, took us on as a ‘love’ project. The branding’s really nice and there’s a good deal of localism – you’re in Hackney, drink Hackney Brewery beer. Our market is anyone who likes good beer. We tend to brew the beers that our friends liked when we were home-brewing. We know people like them! If I see our beer in a pub I tend to try it and then buy something else. I really like our beer but if I’m drinking it I’m always thinking about how we can improve it, and if I’m down the pub I don’t really want to be at work. There are loads of good brewers out there and if you try their beer you get new ideas. Different beers for different occasions. I currently really enjoy our American Pale Ale. We’ve brewed over a hundred commercial beers now and at the start had a couple of bad batches. Sent it to drain. Very upsetting, but if it’s not good enough then learn and move on. We tend not to just down to time constraints and fermenter space. We’ve made a couple of beers for the Signature Brew lads and helped mash in for the London Brewers Alliance collaboration but that’s about it. There are loads of good ones. Apart from all of the London Brewers Alliance, of course, I’m going to play it safe and say Darkstar, Thornbridge and I’ve always liked the beers Hawkshead make. I’d quite like a whole weekend off at some point. Seriously though, we’re not planning on taking over the world. We’d like to steadily grow to the point where we can employ local staff, and keep the brewery running succesfully while making interesting and very drinkable beers. That’s a big question. I think the kind of beers we’re making are slowly on the up. There’s more variety than ever and more interest than there has been for a long time. With the proliferation of new breweries, at some point the market will eventually become saturated. Hopefully we’ll still be about making great beer. Our web address is www.hackneybrewery.co.uk. We update it as often as possible but when your retired mum and dad are telling you to add more content you know you could do better! 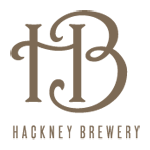 Our twitter handle is @hackneybrewery – if you say something nice I tend to respond.